Begin­ning to realize that I dislike repeat signs, nota­tion­ally and concep­tu­ally. They are tiny worm­holes in music during which I seem to give up on anything inter­pre­tive; I don’t know what to do with them. I some­times feel a creeping dissat­is­fac­tion with my perfor­mances of the first section of Kreis­le­ri­ana (and yes, I realize my obses­sion with Kreis­le­ri­ana)—even when the phrases were phrased, the notes hit accu­rately, and the pedaling clean, the overall form had an inap­pro­pri­ately sing-song quality, the over-neatness of rhymed couplets. The relent­less modu­la­tions and impul­sive rhythms felt pinned down. The problem, I think, is with the little air-spaces between repeats—between achieve­ment of the high D and return to the initial A—during which the whole thing slackens and comes tumbling down; the visual disrup­tion of moving one’s eyes back­wards over a chunk of music becomes a few millisec­onds of help­less­ness. My theory is that this all could have been avoided by writing out the repeats, so the music was simply contin­u­ous, which of course is how it should sound. I was wonder­ing if you were looking at this when you wrote that piece (I forget the full name) — the mini­mal­ist (?) 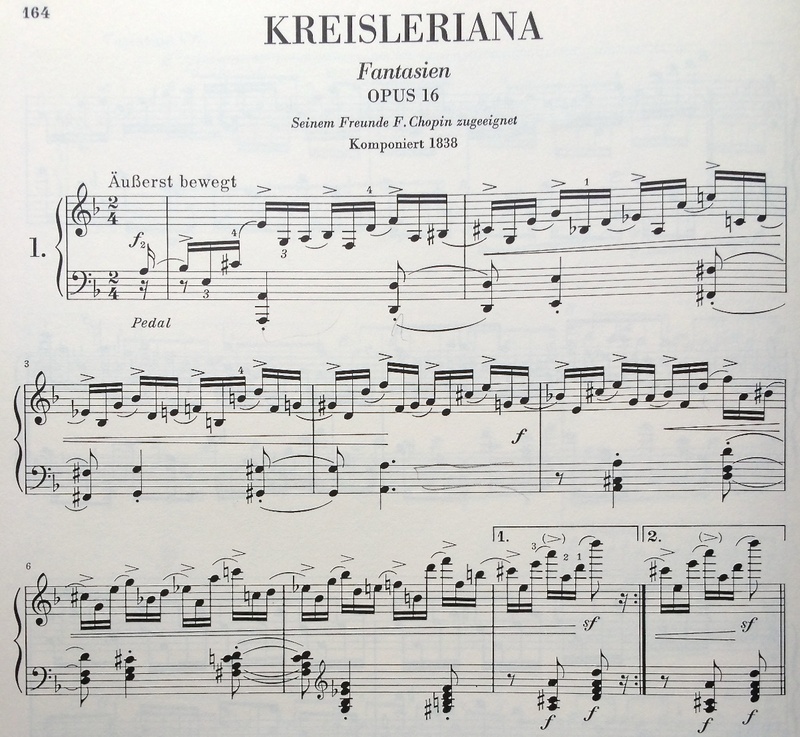 flowing river piece for the piano, the one with the percus­sive high and low notes?